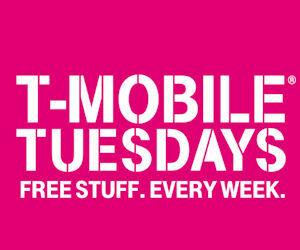 Every Tuesday, T Mobile Gives Away FREEBIES To Their Customers! Home Free Stuff Every Tuesday, T Mobile Gives Away FREEBIES To Their Customers! Do you have a cell phone plan through T Mobile? If so, be sure to check out T Mobile Tuesdays incredible freebie offers! T Mobile customers can get all kinds of awesome freebies and deals each Tuesday. The freebies and deals vary from week to week, but they are always nice offers that you will not want to miss. For example, T Mobile gives away freebies such as Wendy’s frosty offers, delicious FREE wings at Buffalo Wild Wings, FREE movie rentals, special prizes and giveaways, and so much more. In order to get your T Mobile Tuesdays freebies, all you have to do is access your app on your phone. Freebie offers become available every Tuesday, so if you miss one just check out the freebie or deal available the following week. Be sure to download the T Mobile app to your phone so you can take advantage of the freebie offers. You can find the app in the iTunes store or in the Google Play store. Once you have downloaded the T Mobile app, don’t forget to check it each Tuesday to find out what awesome freebie is being offered to you that week! You never know what you will receive.